MSI is well known for its motherboards and graphics cards, but it is also a player in a significant number of other markets. At a recent press event, it showcased its latest innovations in monitors and pre-built desktops. Starting with monitors, MSI had two rather swish 27” curved panels on display: the 1080p Optix MPG27C and the 1440p Optix MPG27CQ. As you might expect, these are primed for gaming, using VA panels to balance speed (1ms response time claimed) and image quality and sporting a 144Hz refresh rate and FreeSync support. With even the 1080p option carrying a hefty MSRP of £450 (£520 for the 1440p one), the new Optix screens are clearly high-end offerings, but if you're lucky enough to be able to afford three, the curved screens are designed to be more immersive than flat screens that force you to awkwardly angle the neighbouring panels. The core specs look promising, then, but undoubtedly the key feature is the – wait for it – integrated RGB lighting! However, for once this isn't (just) for show. As well as patterned illumination on the back, there are five front-facing light bars along the bottom edge. Leveraging SteelSeries' GameSense technology via a USB cable and the SteelSeries Engine software, the light bars (each comprising eight individual LEDs) can be used to represent in-game data from popular competitive titles including CS:GO, DOTA 2, and Minecraft as well as even Discord. Support is also inbound for one 'very popular' (wink wink) multiplayer title. The lighting cannot be used to give users information not already in the HUD, but it can be used to show you things like health, ammo, and kill count in a way that's probably more obvious to your peripheral vision when your eyes are focussed dead centre. While the utility of the LEDs remains to be seen, even without them the monitors are great looking bits of kit. They're due to be onsale in late April, and we currently have a sample in the office – stay tuned for a full review in the coming weeks. Moving to desktops, the current focus for MSI are two high-end models: the latest Aegis PCs and the new family of Infinite desktops. The top-of-the-line parts in these families are the Aegis Ti3 and the Infinite X. Both come in cases around the 40L volume mark (equivalent to a small mid-tower), but they pack in punchy hardware including the Core i7-8700K and GTX 10-series cards (even SLI GTX 1080 Ti is an option), which are of course MSI's own models. 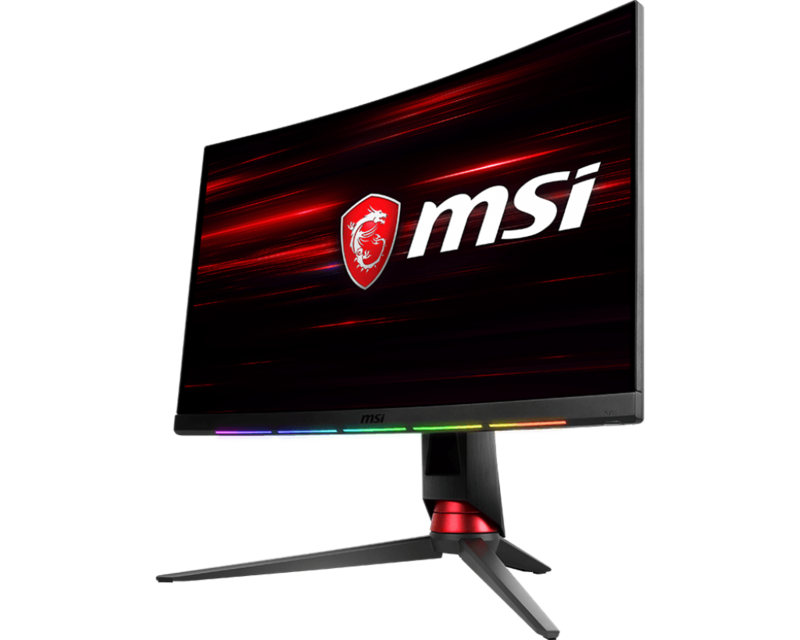 There will be numerous configurations available, but it's still clear MSI is looking to pack serious gaming punch into these machines. While the two chassis are markedly different in design, both support vertical GPU mounting. The Infinite case, which more closely resembles a typical tower, also has the option of a tempered glass side panel. The Aegis, meanwhile, seems to target keen LAN goers, featuring a sturdy carry handle and built-in hangers that can be used for audio or VR headsets. Both models also follow the principles of MSI's Silent Storm cooling, which essentially means they separate the PSU, GPU, and CPU into their own thermally isolated chambers so that heat and airflow from one does not impact the others. Taking advantage of the unlocked CPU, MSI has built-in Game Boost buttons that apply an automatic overclock of up to 15 percent. It probably helps, then, that the CPUs are liquid-cooled as well using an all-in-one setup. This being MSI, RGB lighting is another tickbox ticked, and this is controlled through the Mystic Light ecosystem. So far, so predictable, but one rather cool thing we saw for the first time was the new Gaming Storage PCIe add-in-card. Exclusive to the Aegis family, the card initially looks very much like a blower-style graphics card with a single radial fan, a shroud that fully covers the PCB, and a 16x PCIe connector. Inside, however, is not a GPU but two M.2 SSDs striped in a RAID 0 configuration for maximum speed. NVMe RAID is typically the reserve of the X299 and X399 platforms that are equipped with many more PCIe lanes, but the Gaming Storage works on Z370 by using eight of the 16 available PCIe 3.0 lanes that are directly connected to the CPU, thus bypassing the slower chipset route. This leaves eight lanes still available for graphics cards, and even for flagship models that's more than enough so as to not be a bottleneck. As you might expect, the card can reach blistering speeds. A live demo using two Samsung M.2 NVMe drives saw sequential read speeds well over 6GB/s and sequential write speeds approaching 3GB/s. There are practical benefits too, not just in terms of loading games faster, but also for those into content creation – you can expect considerable boosts to load times when working with large files. Sadly, MSI has no plans to sell the Gaming Storage card separate to the Aegis Ti3 desktops, but it has said it is open to the idea if the demand is there. This Intel Core i7+ system pairs an Optane SSD with a 2TB secondary HDD.